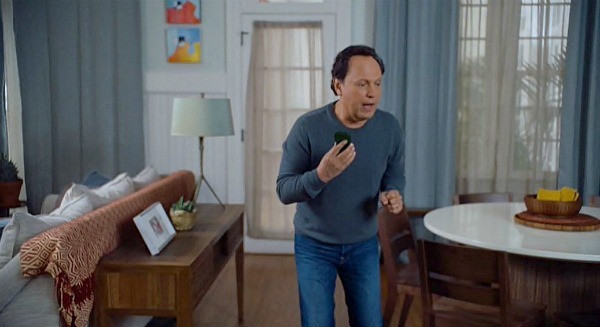 When I told my daughter Lily that I was getting a lot of requests to feature the house from the Billy Crystal comedy Parental Guidance, she said, “Oh, we watched that one at school! 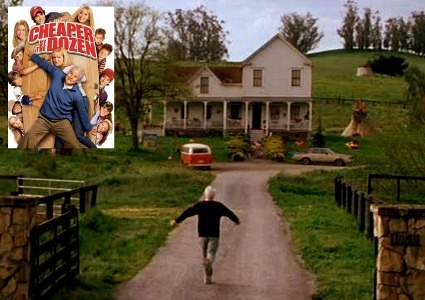 The movie’s kind of cheesy, but the house really is cool. 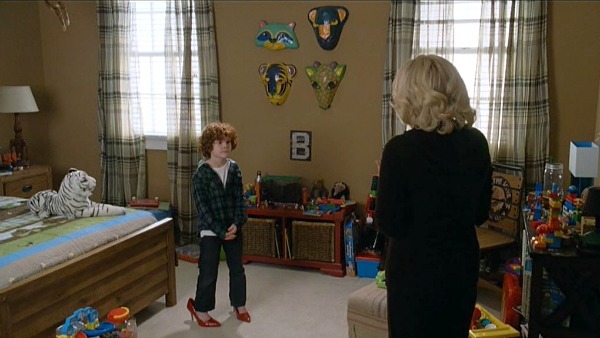 You’ll like it, Mom.” So I checked it out and she’s right — it’s a great house. 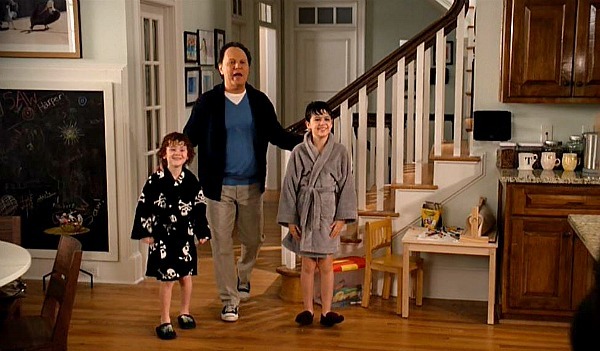 Billy Crystal came up with the idea for the movie after he and his wife babysat their own grandkids for a week. Bette Midler was cast as his wife and Marisa Tomei plays his daughter who lives in Atlanta with her husband and three kids. This is the white clapboard house they found in Dunwoody, a northern suburb of Atlanta. 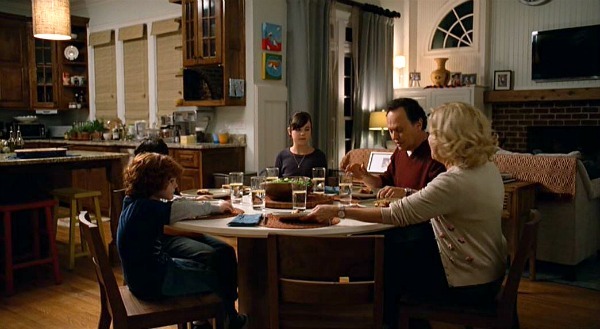 The family had to move out for a few months during filming. The other issue was that the house is nearly 6,000 square feet, but they didn’t want it to look like the family was living in a place that big (or expensive). They tried to shoot it so it looked a little cozier than that. The house was built in 2003 and was inspired by the farmhouse architecture of a Southern Living house the family had toured nearby. Alice’s husband Phil (Tom Everett Scott) has turned it into a “smart house” with his invention R Life. The house does everything from raise the blinds and start the coffee in the morning to announcing when a family member walks in the door. David Bomba was the production designer on the project. 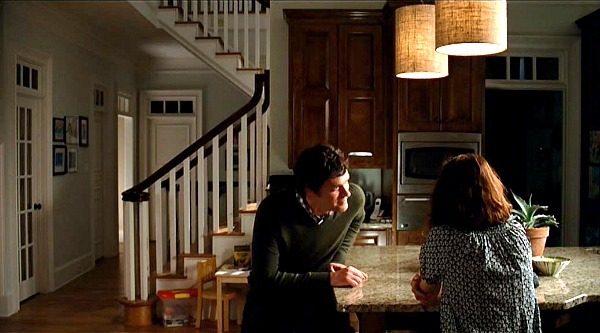 He redecorated the house and made it look more modern. Artie and Diane can’t help but notice that most of the photos on the mantel are of the other grandparents. 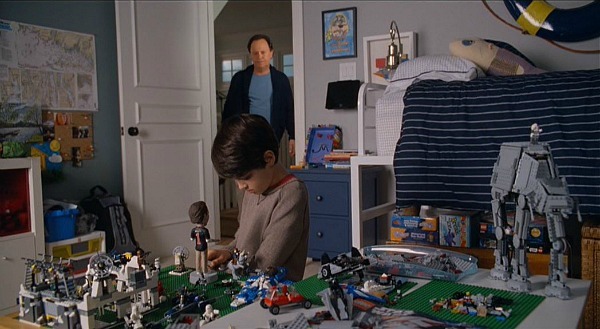 There are 5 bedrooms in the house and 3 of them had to be redecorated as rooms for the kids in the movie. One of the rooms that wasn’t in the real house was the guest room that Artie and Diane stayed in. It was built on a soundstage. 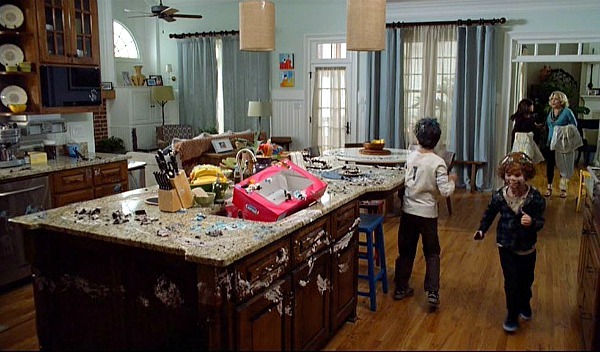 Remember that cake fight I mentioned? 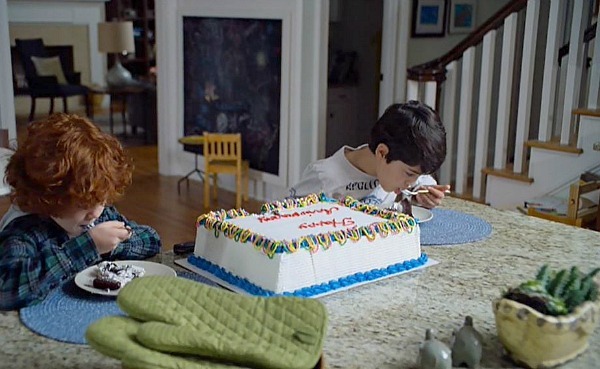 The kids “went crazy” after Grandpa Artie gave them cake and stepped outside for a minute. When he came back, the kitchen looked like this. The director says they had no idea how badly the blue icing on that cake would stain everything and everyone it came in contact with, or how difficult it would be to clean. This “smart screen” in the kitchen is one of the features of Phil’s R Life program. You can choose your music, tell the dishwasher to start, set the alarm, etc. But when they were filming, it was just a blank green screen they were pretending to type on. It’s interesting to see how just a few changes like that can give the room a whole new vibe. 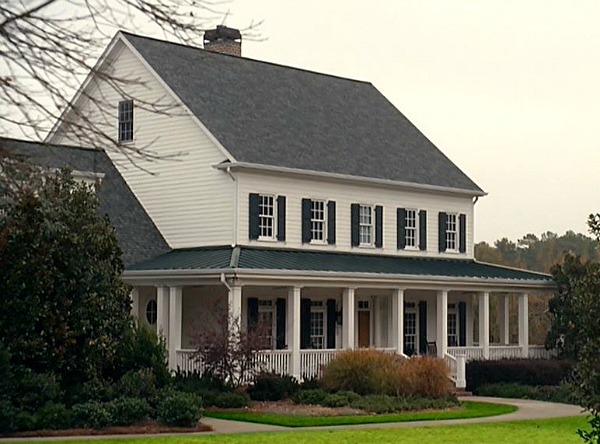 By the way, the ranch house where Artie and Diane lived (supposedly in Fresno) is nearby in Alpharetta. It was on the market recently and sold for $240,000. We just watched this (a couple of times) last weekend! My 9 and 7 year old boys loved it. My first thought was, I wonder if Julia will feature this house! I’m not at all crazy about the blah and drab “contemporary” decor that they chose. It has absolutely no life and doesn’t go with the exterior at all!! 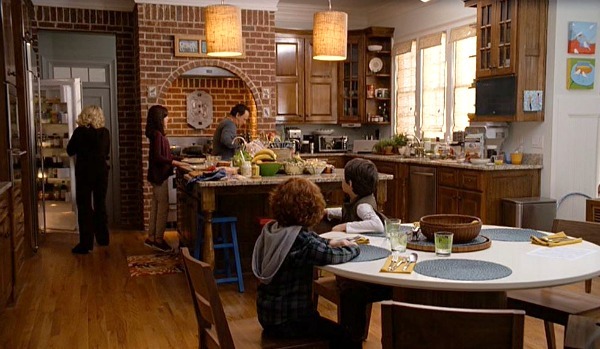 I also wonder how much a family gets paid when their home gets chosen to be a movie set. It would have to be a fortune for me to even consider it!!! Yeah, and I’d want extra if they were going to smear cake frosting all over my kitchen! Ha. Nice house! LOL @ spraypainting the yard! This looks like one of those frustrating yet funny movies, like meet the fockers. I hate to say it because I so love the exterior of this house but the inside (except for the brick fireplace in the kitchen) just doesn’t do it for me. 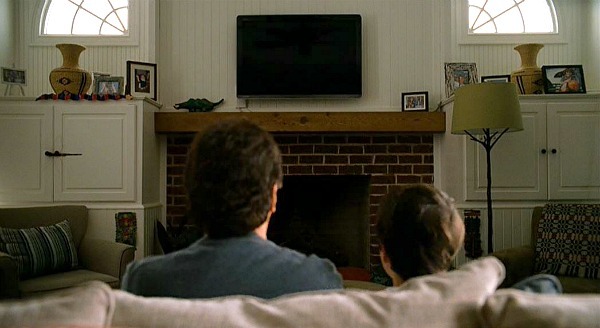 I wonder if anyone ever regrets letting a movie be shot in their house. I am sure the movie people are very careful to get everything back just as it was, but some damage must go overlooked. I live in a college town and some of my neighbors work with brokers to rent out their houses on football weekends. The family moves out for two days and complete strangers stay in their homes for the weekend. You can earn $2000 for renting out your house for a weekend, but I am not at all tempted to do it myself. Yeah, I’m with you. I would have a really hard time renting my house out even for the weekend — although the money would be nice! I’ve never seen the movie, although I love Bette Midler! 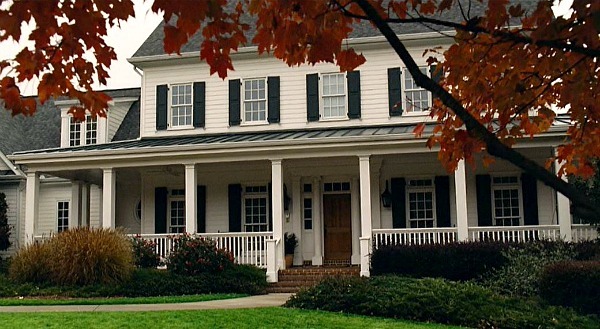 I loved the exterior of the house with the big covered porch, and the smart screen in the kitchen! 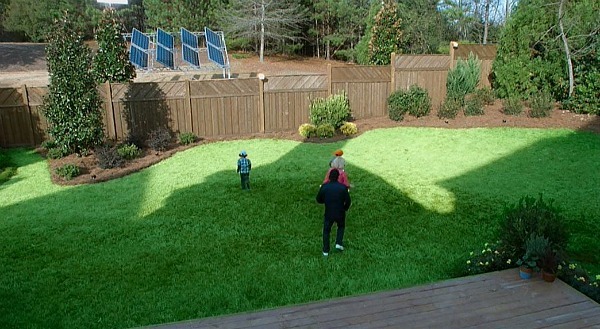 Imagine painting the grass green instead of having to put in new sod, smart for a movie shoot! Loved that movie! The house is gorgeous too! I like the pendants the production crew added a bit better though. It seems like almost all movie and TV houses have a front and back (kitchen) staircase so the actors have an additional escape route. I love your commentary on this as well as all the movie/tv houses you feature. You give me a great break in my day. Nice house. I’m a covered porch kind of guy, mostly because I like sitting and playing my guitar outside, so the front porch and the back deck area is great, I don’t even mind the brown lawn. But I’d pass on the movie version inside style. I didn’t see the movie, so I don’t know what those small solar panels were ‘supposed’ to be powering, but I LOL’d at that photo – that’s hardly enough to power a couple of appliances let alone a huge house. What a nice house. I love that front porch, it is to die for. As for the interior, I’m not a fan of the decor. It’s too contemporary and doesn’t fit with the exterior. I do love that fireplace mantel and the back staircase, though. Two things I would want in my dream house. Ok. Lily watched this at school????? Sheesh, the only things I ever got to watch were creepy and educational. 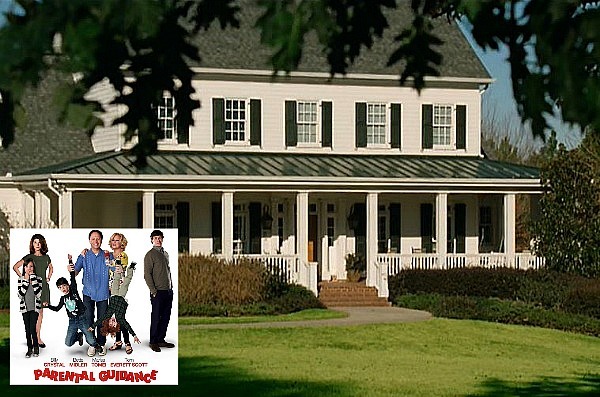 It reminds me of the Father of the Bride House……..tin that movie the back staircase off the kitchen was a favorite of yours and mine! 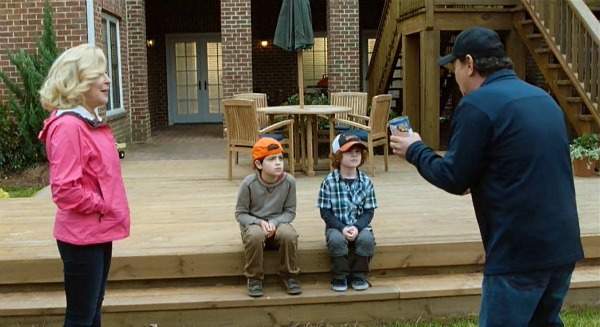 This movie might scare me off from being a grandparent….. I saw this movie in a flight, and I enjoyed it for the houses in it. Julia sincerely I miss the Movie mondays, I love when you make a post about movie houses , all of them. Thanks for share, you made my day. The reason the grass was brown is most likely it is Bermuda grass, which is planted extensively in the Atlanta area. Bermuda takes sun and heat and humidity pretty well. But, It “browns out” in the winter when it goes dormant, and greens up again in the spring. From the photo it looks like its very early spring. I never understood giant lawns like that (leaving home visible from way way far away). Plant some trees or at least break up the lawn (mowing creates 4x or more pollution than driving a car) with some landscaping. Dear Julia! Congratulation for this post! Such a wonderful house! Why don’t you want to write about Blue Jasmine movie? in San Fransisco. Greeting from Budapest, Hungary!!! I LOVE this movie!! I’ve seen it a few times and have shown it to friends-we all love it. Yea, we live in Atlanta, too! I know I’m a little late on this one. But I had to mention it… $240,000 for a 6,000 sq ft house?! Where was I when this went on the market? the movie is based around. That home is not on the market..